The National Sleep Foundation’s 2018 Sleep in America® poll finds that among U.S. adults with excellent sleep health, nearly 90% say they feel very effective at getting things done each day, compared to only 46% of those with poor sleep health. 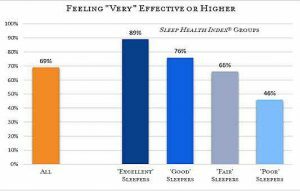 Exhibit A: Overall Sleep Health Index scores were split into four equally sized groups (referred to here as excellent, good, fair, and poor sleepers) and crossed with responses to how people feel in terms of getting things done each day (options: extremely, highly, very, somewhat, and not so effective). The chart represents the percent of respondents who reported feeling ‘very’ or more effective in each group. The study also shows that only 10% of American adults prioritize their sleep over other aspects of daily living such as fitness/nutrition, work, social life, and hobbies/personal interests. “The data are clear: Good sleepers realize the benefits of a good night’s sleep and see themselves as more effective at getting things done the following day. It’s therefore disappointing to see so few people actually prioritizing their sleep,” said Maurice Ohayon, MD, DSC, PhD, Director of the Stanford Sleep Epidemiology Research Center and Chair of the National Sleep Foundation’s Population Health and Methodology Council. Exhibit B: When asked which of five items was most important to them personally, 35% said fitness/nutrition, 27% said their work, 17% said hobbies/personal interests, 10% said sleep, and 9% said their social life. 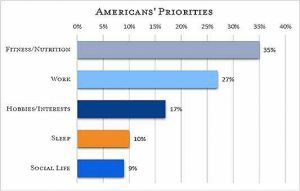 The 2018 Sleep in America poll finds that a majority of the public (65%) says that getting enough sleep makes them a more effective person, yet 41% admit to rarely taking into account how much sleep they need in planning for the next day. “This is exactly what I see in my practice every day,” responded Dr. Joseph Ojile, Chair of the Foundation’s Board of Directors. “People, from children to adults, are consistently overscheduled.